The CHOC Children’s Heart Institute proudly offers an Interventional Cardiology Program for the diagnosis and treatment of cardiac conditions. Interventional cardiologists do not diagnose or treat patients using conventional surgery; they specialize in performing minimally invasive cardiac catheterization procedures in our state-of-the-art catheterization laboratories. Cardiac catheterization is a specialized procedure in which a long, flexible tube (catheter) is inserted into a blood vessel (usually in the leg or arm) and guided into the heart, allowing a close look at the structures inside. Cardiac catheterization may be recommended to help diagnose a heart problem. It can also be therapeutic and provide treatment or intervention for a heart condition, such as a congenital (present at birth) heart problem. Advances in interventional cardiac care have changed the ways in which we diagnose heart conditions in babies and children. Because of the better imaging now possible with echocardiography and magnetic resonance imaging (MRI), fewer cardiac catheterizations are done to diagnose a heart problem. Instead, catheterizations are often done to treat an already known heart disorder. Narrowing or re-stenosis of shunts. Treatment of patients with coarctation of the aorta and complex arch obstructions. Cardiac catheterization procedures are performed in one of two state-of-the-art catheterization labs in the Tidwell Procedure Center at CHOC. The child’s doctor will discuss the risks and benefits of the procedure with the child’s family and require written permission (informed consent) from the child’s legal guardians to do the procedure. Upon arriving at the procedure center, the child will be taken to a “pre-op” room where he or she is prepared for the procedure. This includes taking vital signs, having the child change into a hospital gown and starting any necessary IVs. The child is also given a sedative to help him or her relax before the procedure. Once in the “cath lab,” he or she will usually receive general anesthesia. The child will lie on a small table with a c-shaped X-ray machine surrounding it. Heart monitors and other equipment are nearby. A specially trained staff of nurses, technicians and doctors will monitor the child and make sure he or she is comfortable during the procedure. An injection of local anesthetic is given under the skin where the catheter is going to be inserted. Next, a thin, flexible tube (catheter) is inserted into a blood vessel, most often in the groin area (the crease of the leg where it bends when sitting). The catheter is guided up the vessel (artery or vein depending on the purpose of the procedure) towards the heart. 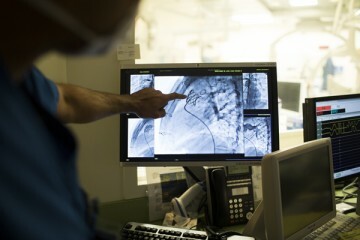 The cardiologist uses X-rays, called fluoroscopy, to help see the movement of the catheter. From the vein, the catheter enters the right atrium–the top right-hand chamber that receives oxygen-poor (blue) blood from the body. Eventually, the tube will be guided into the right ventricle, the pulmonary artery, and perhaps the right and/or left pulmonary artery branches. In addition, another catheter may be placed into the artery in the groin, which can be advanced to the aorta. Blood samples may be drawn from each chamber and each blood vessel and the oxygen content measured. Blood pressure measurements may be made inside each chamber and each blood vessel. Contrast dye may be injected into the catheter and, as it flows inside the heart, X-rays may be used to show the path the dye takes throughout the heart. X-ray movies (angiograms) are made as the catheterization proceeds. This lets the child’s cardiologist review the data after the procedure. If surgery is planned, the heart surgeon will also review the data. In some cases, certain procedures may be performed in lieu of open-heart surgery or in conjunction with a heart surgeon. One such procedure is the insertion of a revolutionary Melody® Transcatheter Pulmonary Valve. Learn more about what to expect at the Tidwell Procedure Center. What is a Melody® Transcatheter Pulmonary Valve? Among the variety of treatment options available through the Interventional Cardiology Program at CHOC Children’s is the Melody® Transcatheter Pulmonary Valve that offers children with failing pulmonary valve conduits a new option for their condition without open-heart surgery. CHOC is proud to be one of less than 100 centers in the United States to offer this FDA-approved alternative to open heart surgery. CHOC boasts a program that rates above average in the number of these procedures performed in the nation as well as some of the best patient outcomes. Learn more about the Melody valve at CHOC. What happens after a cardiac catheterization procedure? After the procedure, the child will need to lie still for four to six hours to decrease the risk of bleeding, and pressure must be applied to the site where the catheter was inserted. Special machines are used to monitor the child’s heart as he or she recovers. Most patients go home on the same day, but some will stay in the hospital for one night for observation. In the days following the procedure, patients may experience mild symptoms like an achy chest and discomfort or bruising in the area where the catheter was inserted. Some children might also notice skipped heartbeats or irregular heart rhythms. Most children can return to their normal activities within a few days. Caregivers should contact the child’s doctor immediately if they notice unusual pain or swelling, excessive bleeding or if the child complains of consistent irregularities in their heartbeat. It is important to follow all of the doctor’s instructions, especially regarding follow-up visits, medication schedules and safe levels of physical activity. CHOC Children’s Heart Institute is one of less than 100 centers nationwide certified to use the first FDA-approved transcatheter heart valve alternative to open heart surgery for replacing regurgitant or stenotic pulmonary conduits. 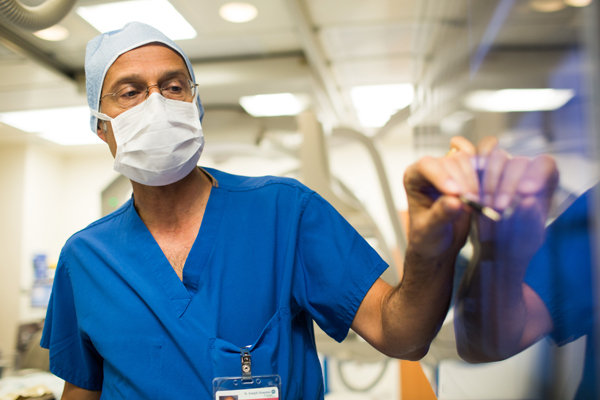 According to CHOC Children’s interventional cardiologist Farhouch Berdjis, MD, Melody TPV (transcatheter pulmonary valve) therapy improves right ventricular outflow tract (RVOT) conduit function and lengthens the conduit’s lifespan, delaying the patient’s next open-heart surgery. “The patient receives the same pulmonary conduit as would be provided through conventional open heart surgery, but in a far more gentle manner,” said Dr. Berdjis, who trained for several months to become certified in the Melody TPV procedure. “There is less scarring, less stress to the circulatory systems and faster recovery.” He is performing this procedure in close collaboration with Richard Gates, MD, CHOC surgeon-in-chief and medical director of the CHOC Children’s Heart Institute. Dr. Berdjis said that Melody TPV may not ultimately be a patient’s last procedure, but it will reduce the overall number of major surgeries. “Melody TPV is an example of the groundbreaking therapies that make CHOC a leader in pediatric medicine, and we are extremely proud to be at the forefront of this technology,” he said. Dr. Berdjis has performed about 50 Melody valve procedures to date. Of those procedures, 90 percent of patients are doing well, without any need for further catheterization surgery, up to four years after the valve placement. Meet Dr. Farhouch Berdjis as he gives details about what the Melody® Valve is – how it works and what it’s made of. View more videos about the Melody valve. Dr. Renella, CHOC Children’s, talks about Cardiac MRI, the advanced non-invasive imaging technique for diagnosing heart defects. Our pediatric cardiologists are pioneering catheter-based techniques that replace conventional open-heart surgery for some complex disorders. Dr. Berdjis explains about pediatric cardiac catheterization, a common procedure that helps diagnosis heart problems in children.